Music and poetry: in perfect harmony? While performance poets and popular songwriters used to revel in their status outside the poetry establishment, the critical acclaim afforded to veteran performers such as John Cooper Clarke, feted lyricists such as Bob Dylan and rising stars such as Kate Tempest point towards its contemporary respectability. Yet if the celebration of such artists by the literary world is no longer controversial, there seems less consensus that their work fits into a poetic tradition. Some point towards the rich history of collaboration between the ‘sister arts’ of poetry and music, and see performance artists and rappers as a contemporary extension of the Bardic tradition or the lyric poets. Yet some critics and performers remain sceptical over whether such judgements are being made on a purely artistic basis, or whether they’re driven more by a desire to prove poetry can still be popular and relevant in the 21st century. Where is the line drawn between a witty rap or a catchy lyric and the intense lyricism of poetry? Does music enhance what is innately powerful and unique about poetry or embellish poetry with a veneer that makes it less intellectual and less challenging? When poetry becomes sung performance what happens to the interior experience of how we encounter poetry as individuals? But what is really added to each art form by blending music and poetry? It could be said that the music adds a greater emotional weight to the poem. But what should the audience be doing: appreciating the poem or the music? And is the media and cultural elite's embracing of hip hop and R & B in recent years, a way of trying to deliver moral and behavioural messages to audiences they find difficult to reach? Watch the video of the discussion below. Thanks to Dan Clayton the Leeds documentary filmmaker for this. 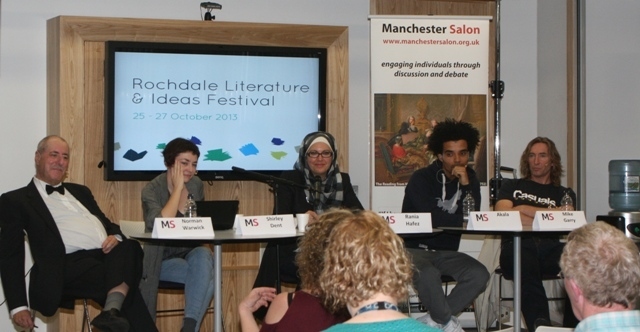 The Rochdale Literature and Ideas Festival is possible because of the generous bequest of Mr and Mrs Maskew. A truly inspirational couple, Annie Cockcroft and Frank Maskew met in Rochdale Library in the early 1950s. The couple shared a profound love of literature and philosophy and inspired others through knowledge and learning. They were a happy and complementary team who enjoyed 26 years together before Frank died in 1981. When Annie herself passed away in 2006 a bequest was made for the purchase of literature and philosophy resources. The Maskew's relationship and progressive thinking formed the basis of their legacy - The Maskew Collection - left to the people of Rochdale to inspire future generations in the joy of reading and thinking. 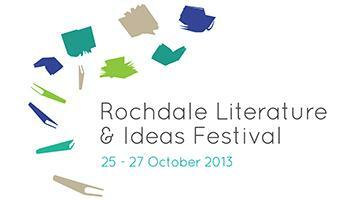 The bequest is being used to establish Rochdale Literature and Ideas Festival for 2013 and annually thereafter. The festival has also been partly funded by Arts Council England’s Grants for the Arts funding, which means the festival can be celebrated borough wide.